Various types of metal particles,mixed in the manufacturing process,are the materials fallen off from the line ,such as iron piece,stainless piece ,and fallen parts,breaks,tears and etc,,,. 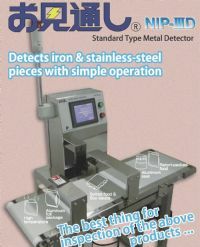 Metal detector inspects these particles in the line,or before shipment and finds it out ,which really produce cost-effectiveness . The NIP3D Metal Detector (Made in Japan by TOK Engineering) can detect foreign metal particles irrespective of the effects of aluminum package and salty foods,high temperature products,and frozen foods.